Four-to-one systems are less popular than 3:1 systems, probably because they require an additional pulley and don't offer significantly more mechanical advantage. However once you learn how to stack a 2:1 on a 2:1 to create a compound 4:1, you'll know how to stack a 2:1 on a 3:1 to create a 6:1 (also a less-popular system, but worth knowing if you are a rigging geek) and how to stack a 3:1 on a 3:1 to create a compound 9:1. Refer to the overview on raising systems to learn more about mechanical advantage systems. The systems we've seen thus far (i.e., the 1:1, 2:1, and 3:1) are all simple systems. The 4:1 system can be rigged as either a simple or compound system. 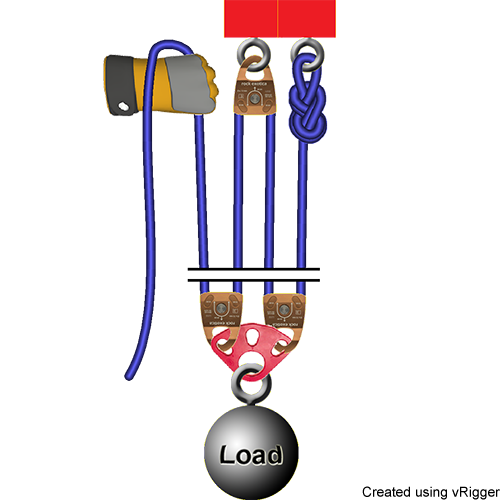 A simple 4:1 system is built by starting at the anchor and threading the rope through pulleys on the load, the anchor, and back to the load. It's one long rope threaded multiple times. 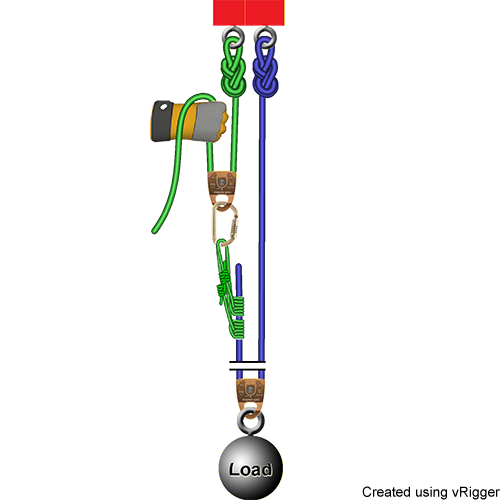 Because the simple 4:1 requires four strands of rope to go from the anchor to the load, it is usually rigged as a piggyback unless the load is very close to the anchor. 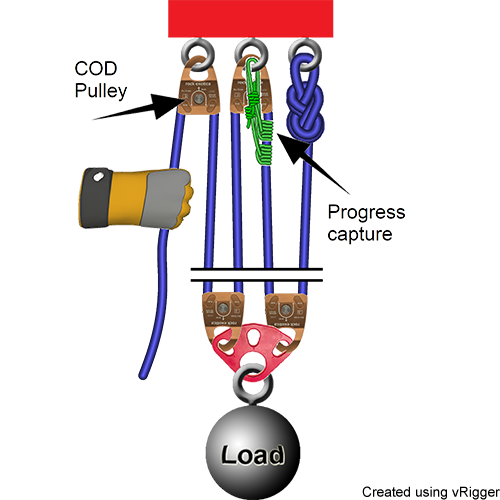 The following illustrations show 4:1 systems without and with a COD pulley. The terms "simple" and "compound" are confusing, because many people find it easier to build a compound 4:1 than a "simple" 4:1. So much for terminology. A compound 4:1 system is a 2:1 system connected to the end of a 2:1 system. In this next system you can see the green 2:1 system is attached to the end of the blue 2:1 system. It is compounding the mechanical advantage. When systems are stacked like this (i.e., compounded), you determine the mechanical advantage by multiplying the mechanical of the two systems. In this example, the advantage is 4:1, because we have two 2:1 system. If you stacked a 2:1 on a 3:1 (or a 3:1 on a 2:1), you would have a compound 6:1 system.